The house is located only 18 km from Florence (15 minutes by train from Florence). External PING PONG (Table Tennis) and Land MULTISPORT (synthetic turf): Tennis Court, Football. 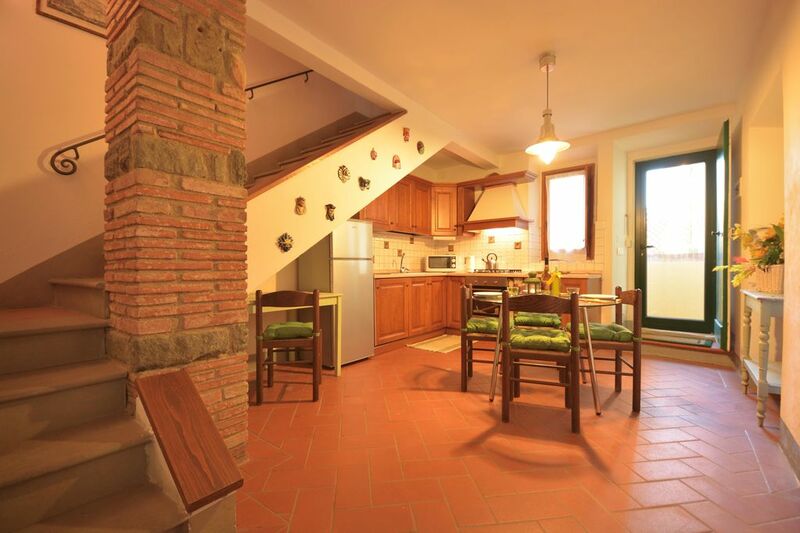 Country house of 100 m2 fully renovated respecting the traditional Tuscan style. Surrounded by green countryside dotted with cypress and olive trees, is the ideal place for walkers and nature lovers. You will love the peace and quiet of this house offers the comfort of spacious rooms and a fully equipped kitchen. Superbe séjour d’une semaine en Toscane, toute la famille a apprécié! Magnifique propriété avec vue sur la campagne Toscane, très propre, avec toutes les commodités. À proximité de Florence et autres sites à visiter. Je recommanderais cet endroit à nos proches et amis. Propriétaire très sympathique et super accueil ! Nous avons passé une semaine mémorable malgré la chaleur, peut-être ajouter des ventilateurs dans les chambres en période d’intense chaleur! Perfect place for our Florence trip! We loved it! It fit our family of 5 perfectly and was warm and comfortable. It had everything we needed. Perfect location to take the train into Florence or Pisa so we didn't have to deal with traffic! Christina was great and we loved the bottle of Olive Oil from her own vinyard! Would recommend and stay again. The house is a 20 min drive from the hustle and bustle of downtown, a quiet farmhouse apartment. Cristina welcomed us with a beautiful food basket, her own olive oil, pasta, sauce, etc. and even a bottle of wine. The home is nice and spacious and the kitchen is well equipped with all necessities. There is WI-FI, but it is a little spotty at times. The house is situated along the flight pattern of the airport, so it can get a bit noisy at times. There is a small washing machine for your clothes, but you have to line dry inside the house. Drying the clothes was a challenge because it was very humid outside. There is a laundry mat in town if you need your clothes cleaned and dried faster. There are plenty of restaurants in town, that stay open late, even on weekends. We stayed 7 days, the house is very close to the train platform, with free parking. It was easy to buy train tickets and take the train to Florence and then to Pisa. We would recommend staying here especially if you have kids. One bedroom had a queen size bed and the other room had three twin beds, I would suggest a curtain to separate the room from the entrance to the bathroom for a little privacy. The bathroom/shower is a good size and supplied with bath towels . We enjoyed our stay. We had great idea to stay in Cristina's appartment instead of overcrowded Florence. It's located 15 min away from Florence and around 1 hour from Pisa or Lucca (by train). Located in oil garden, gave us the opportnity to relax in very quite environment(exceptions - few planes during the Day). You need the car but everything Else you need ( stores, train station, restaurants is in The distance of 5 km. For restaurants we recommend La Musica and De Bertone. Nous avons passé un très bon séjour chez Cristina qui est très accueillante .La maison idéalement située pour visiter la toscane et se trouve dans une bâtisse au milieu des oliviers. Le panier d'accueil est sympa avec de bons produits. La maison est propre, confortable et le linge de maison a un parfum très agréable. Un grand merci à notre hôte pour ce superbe séjour.